After this, well, weird App State season, this is probably the most beautiful thing this blogger has seen in a while. No name plate yet, but she’s a looker. So pretty, in fact, that it almost makes us forget about that disgraceful night in Amherst, Mass. Almost. To review, Appalachian State has been Champions of the Sun Belt Conference twice since moving to the FB$ division in 2014. What’s there to say about Saturday’s 63-14 demolition of Louisiana-Lafayette Louisiana? Not much. In a good way. Those Cajuns don’t do much Ragin’, though they have some nice pieces on the offensive side. Lou-La’s D, well, it’s just downright offensive. (Former) Head Cajun Mark Hudspeth got the boot after his team stunk up The Rock, and he deserved it for fielding that defense alone. Though the Mountaineers’ first drive stalled, it was fairly obvious the App O was going to have a very grande afternoon at 3,333 feet. The Mountaineer OL finally looked physical and dominant. Jalin Moore is healthy, and good lawd, is he a beast when not banged up. And young buck Thomas Hennigan is a bonafide stud. 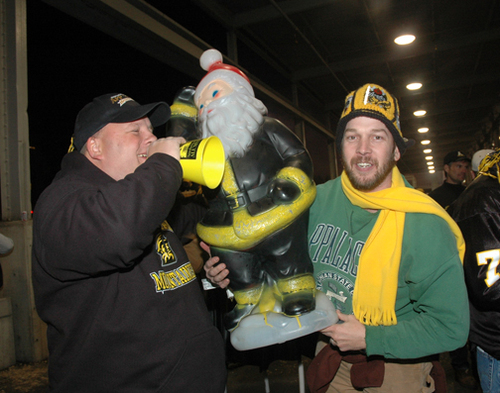 …Speaking of the night before the night before Christmas: We’re confident the Toledo Rockets will come to the Dollar General Bowl armed with a play chart loaded with QB draws and outside passes. Gulp. The Rockets, folks, are legit. Plenty of time to chew over what should be a #FANtastic match-up in the coming weeks. For now, it’s time to relish another Championship season. Though our outrage over Senior QB Taylor Lamb not making the First Team All-Sun Belt is palpable. And for those miffed about a trip to Mobile, Alabama, consider this: The #FunBelt is sending App State to face the outright MAC champion. Not Troy. Champ vs. Champ. A revenge game for the Rockets. Taylor Lamb’s final game as a Mountaineer. As the voice of the Mountaineers noted, App-Toledo will be the lone non-New Years Six bowl game pitting one conference champ against another. Storylines aplenty. We expect a good one in a few weeks. A Mountaineer campaign that at times tasted so bitter ended so very sweet. Taking down a very good Group of Five team in Toledo on National Television would finally make us forget about that ugly UMass loss. And it would be a truly fitting way to send Lamb and the other App seniors out. Seeing No. 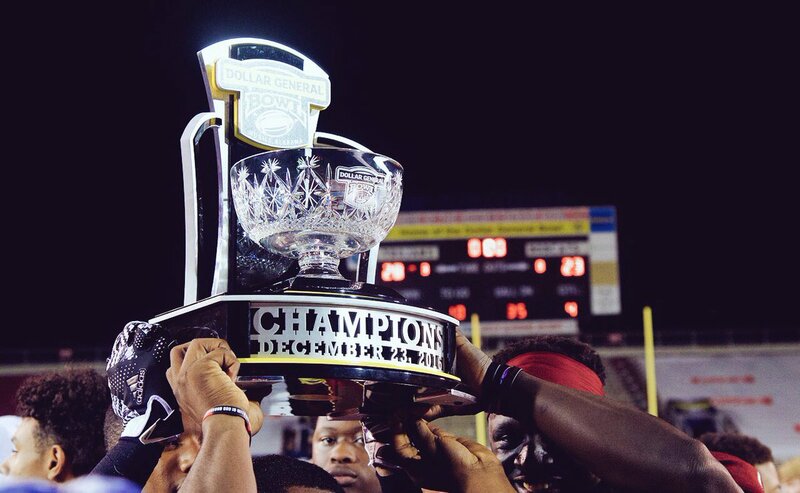 11 lift one last piece of championship hardware would be a great Christmas gift. It’s the one we want. In fact, it’s about all we want from Santa this year. I would LOVE to go to Mobile and see my Apps in another bowl. The only problem is making it back to Charlotte in time for the 1:00pm kickoff for the Panthers game against the Bucaneers. According to Google Maps I'd have to leave Mobile NLT 4:00am to have a shot at making that game, and that's with no stops. It's a good problem to have though.